Our Sensory Toolkit includes materials that help with earlier identification and earlier therapy for children’s sensory issues, which can help children reach their fullest potential. See our checklist of sensory behaviors for children 1 month in age all the way to 6+ years old. While your child may not check each box, missing just a couple items should not be cause for concern. 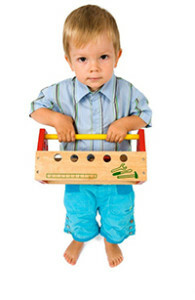 Track baby’s sensory milestones and provides a list of games and activities appropriate for their development stage. Learn the signs and symptoms of a sensory issue, how occupational therapy can help children, and the different parts of the sensory system. All have accompanying handouts. Read the latest research on sensory integration and processing. The behaviors of a child with sensory issues are extremely varied, making them hard to detect. The sensory toolkit helps parents and health professionals to identify sensory processing and integration issues. When healthcare professionals and parents know what to look for, it is easier to recognize these signs.